Photo from Noodlehead link above. I’ve already got mine cut out–using fabric scraps from the stash, of course–and I’m using this super cool nylon jersey (stabilized with interfacing) for the front flap. The outside will be this black textured fake suede and the lining a Laurel Burch fabric. Cut out my new wallet. Also something I’ve been pondering for a while, as I’ve been wanting a way to grab all the essentials quickly when I want to go out for a walk. This one is exactly what I had in mind–I can just stick my phone in the outside pocket, snap a strap onto the wallet, and go. This could be quite the challenging pattern; it actually comes with a long list of warnings! 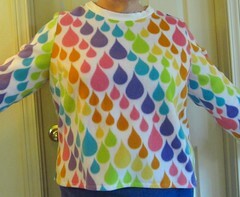 Photo from Craftsy link above. Do better on healthy eating and exercising. As I’m hoping to be employed soon (should find out how my job interview went at the end of the week, by the way), I’ve been thinking about what I might need to sew to complete my work wardrobe. Then I realized that I’d have a lot more work clothing to choose from if I could get rid of that extra 5 or 10 pounds I picked up over the winter. Hmmm . . . .
And now on to the tree pr0n! I spent the weekend in Newberg, OR, while my honey rode his bike for 600 kilometers. We took the scenic highway home and took a few photos on the way. The Columbia Gorge, taken from the Women’s Forum viewpoint. All kinds of dramatic sky and cloud stuff happening. Near the base of the Falls. Columbia Gorge, taken at Rowena Crest. Another angle of the view from Rowena. Not shown: the gale-force winds trying to knock me over as I took the picture. They were kind enough to blow away the clouds, though. Extremely helpful sewing assistant bear. Pretty productive week, I think. Let’s see how I did on my goals from last week. Cut out a black knit skirt. Done! If you’ll recall, I’m planning to do view G here. Cut out this blouse (or attempt to). Done! That’s the blouse I was cutting out in the picture at the top of the post. And I actually finished sewing it, sort of by accident. Was puttering away slowly on it Friday afternoon, then felt like sewing again on Saturday, and suddenly it was time to attach the top half to the bottom and only the hems were left to do. Post coming soon! Try making a cat scratcher. This is about 18″ x 10″, the same size as the store-bought scratchers that Pooh loves so much. This took many hours–and most of the glue in the house–but the basic scratcher is done. Now I want to see if I can’t class it up a little bit. I want to put together a sort of frame for it and cover the sides with fabric, which I think will be a very cute addition. Exciting process shot featuring glue and catnip. Make the skirt. It has just one piece–a big rectangle that you wrap around yourself and secure with a couple of buttons. I’m not at all sure it’s going to work on me (the big question is whether I have enough of a waist to get it to stay up? ), but if it does, it will definitely be the fastest skirt in sewing history. And I’ll be whipping out another one in a camel color. I’ve got a job interview next week (EEK! ), so I’m thinking ahead to getting the closet stocked with more professional-looking secret pajamas, just in case. Make a tote bag for SCRAP. We’ve been putting together fabric packs to sell–one orphan quilt block or other focal piece and a bunch of fabric remnants that coordinate with it. They haven’t exactly been flying off the shelves, so I thought I would use one of them to make a bag and show what you can do with a mess of scraps. Here’s the fabric pack I chose–a very cute embroidery sampler and some fabric scraps. Should be a fun project, and I’ll get to test an idea I have for a bottle carrier on a bag. And one more item of good news–one of the winners of the Q1 Finish Along didn’t claim their prize, so the organizers drew again and I won! (The updated FAL prize post is here.) My prize is a PDF of a book called “DIY Block Design,” which is interesting, because I have had a thought or two lately about taking a shot at designing my own quilts. Will you just look at this cute little guy? My mother and I took her dog, Regan, over to Columbia Park to meet the squirrels. Had a short list last week, as I was out of town for three days. Let’s see how I did. Done! I should have grabbed a pic before I disassembled it, but it was made with a fairly hideous fabric from my Freecycle haul. I also wrote up some instructions for the circle skirt class I’m going to teach. I’m pretty happy with the process I’ve come up with–it works with either knit or woven fabric, it doesn’t require a zipper or a waistband, and no math is involved. Not quite, but made some good progress. One block done, one about halfway, one not started. I had SO been looking forward to getting together with a new friend for a crafty evening, but she bailed at the last minute, so I kind of lost my motivation and didn’t get as much done as I’d hoped. Cut out a black knit skirt. I had been planning to use this cotton knit for leggings, but realized it’s 2-way stretch, and I’d need 4-way for leggings. So I pulled this wrap skirt pattern out of the stash (it’s dated 2001) and plan to make view G. This will be a nice basic to wear with tunics. More secret pajamas! Cut out this blouse (or attempt to). I’ve been thinking I need some more tops, and pulled out some T-shirt type patterns. But then I saw this post from Lynn and this one from Gayle Ortiz and I thought, you know, I can do something more interesting than a T-shirt. So I looked through my sewing stuff again and came up with this pattern, recently purchased from SCRAP, and this very cool quilting cotton. I’m a little short on fabric to make the top, but I’m going to see if I can make it work. This is Pooh’s cardboard scratching box and he loves it more than anything except the Mama Bear. I recently came into a large amount of cardboard (partner ordered a new plastic mat for underneath his desk chair and, rather than being shipped rolled up, it came packed flat in between two huge sheets of cardboard), so I went a-googling and found instructions on how to make your own scratching boxes. So that’s going to happen this week, and may become another future SCRAP class. While I’m working on that, here are some more pictures from my week! Another one from Columbia Park–baby geese! This past weekend was the Seattle International Randonneurs’ Fleche ride–the 11 teams participating had 24 hours to ride 360 kilometers ending in Olympia, WA. My honey’s team started in Portland, OR, and I drove up to Olympia to meet them at the end. They had great weather the whole way, as you can see in this picture of the Olympia waterfront. On Sunday, after the Fleche banquet, we drove home, taking the scenic route to see if we could get some good shots of Mount Rainier. “The mountain is out,” as they say in Seattle. We took a brief stop at Mud Mountain Dam for a little stroll. And another at Crystal Mountain Resort, where I had a hard time believing I was looking at snow–and lots of people skiing on it–when the temperature was above 70F. A little late, but still in there swingin’! Top priority: make my sister’s birthday present. Done! Took about forever, but look how cute these cat coasters turned out! Somebody posted the link for these on one of my Facebook sewing groups a while ago and I just KNEW I had to make them for my sister. She just got new furniture for her living room, so I made them in coordinating colors. The fabric is hand-dyed wool felt from the stash, and the picture doesn’t do it justice–it is gorgeous stuff. Lots of TINY bits of felt here; I used Tacky Glue to hold things in place, then used a blanket stitch on the larger pieces, running stitch on the tiny ones (the instructions just say to “stitch” without specifying how). Make the Kaffee Fassett dress. 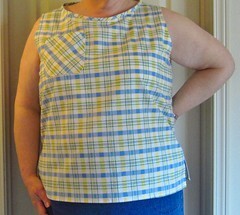 Almost done–just need to attach the bodice to the skirt, sew hems, and do buttons and buttonholes. And I’m not sure how I feel about it yet. Might have been better if I’d used the collar?? Hmmm . . . .
Do a Make-a-List Monday post, hopefully on Monday. Well, I got to it eventually. Stretch goal: do last few bits of spiffing up in my sewing room and take some pictures. Nope. I usually clean up the sewing room after I finish a project, and I’m still in the middle of working on that dress, so it’s a bit scary in here right now. Goals for this week are mostly to tidy up unfinished business as the quarter is ending and I’ll need to link up my finishes. Do a post about it. Work on some more Splendid Sampler blocks. I’m really longing to get to some of the blocks that have applique and embroidery! New fabric! I did some house-sitting for my mother and sister while they were in Oregon last week, and they brought back this Kaffe Fassett jelly roll for me. According to my sister, she had to talk my mother out of getting the pastel cabbage rose fabric–TOTALLY dodged a bullet there. I also got this lightweight border print (well, it’s actually embroidered, but you know what I mean) denim at SCRAP the other day. I saw this post and knew this fabric would be perfect for that pattern. It’s a little wrinkly in this pic, but not bad considering this is after two days sitting in the dryer (hey, I’ve been busy). I went to the Sandhill Crane Festival in Othello the other day, thinking I might learn something about the local birds. What I actually learned: birders are very nice people, but I will never, ever be excited enough about which sparrow is which to be one of them. Also, you get some pretty premium swag when you go to the Sandhill Crane Festival. And spring is here! With the accompanying allergies and gale-force winds! Here are some tiny flowers I found in Wade Park, next to the walking path. Have a great week, everybody, and I hope you’re getting some spring wherever you are. Needless to say, I am feeling a tad bit sluggish and unproductive these days. But I am pulling hard on the old bootstraps and we’ll see if I can do a little better this week. It helps that I have a firm deadline that I need to meet. I don’t have pictures yet, but will definitely get that done soon so that I can do a post and count this as one of my finishes for the quarter. The good news? My partner loves it and wore it the other day to ride his bike to work. The bad news? He came home with his head full of plans for THE NEXT JACKET he wants me to make him. Sweet Jesus, give me a minute to recover from the stress of this one first, will ya? Luckily, he wants another wool one and suggested I wait until some suitable fabric shows up at SCRAP for it. So that should take a while. Whew. Cut out my Kaffee Fassett dress. 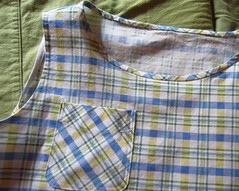 If you recall, my plan is to make the long version of B6760, but incorporate the angled pockets (love them SO MUCH) from B3569. After the challenge of the make-it-up-as-you-go jacket, I was really tempted to skip the pockets and just make B6760 as is, but then I read the instructions on how to do them, and decided they were just too easy. I didn’t even have to move the pleats on the skirt. I am so deeply in love with this fabric that I cut the dress facings from a plain black cotton so that I would have more bright, beautiful pieces of the dress fabric to use in future scrap quilts. Top priority: make my sister’s birthday present. Needs to be done by Monday afternoon at the very latest, and there will be a fair bit of hand sewing involved, so I need to get on this ASAP. Make the Kaffee Fassett dress. I need to get this done while it’s still cool enough to wear it. I actually have SO MANY things I want to get done this week, but these are the ones that feel the most urgent at the moment. Have a productive week, folks, and take good care of yourselves. ETA: Make-A-List Monday is an idea that I borrowed from Sarah Craig over at Confessions of a Fabric Addict and I thank her for inspiring me to try it!